Image size is 12" x 19", printed on heavy paper with substantial border on all four sides. This study includes all four varieties (or breeds, outside of the UK) of the Belgian Shepherd Dog. 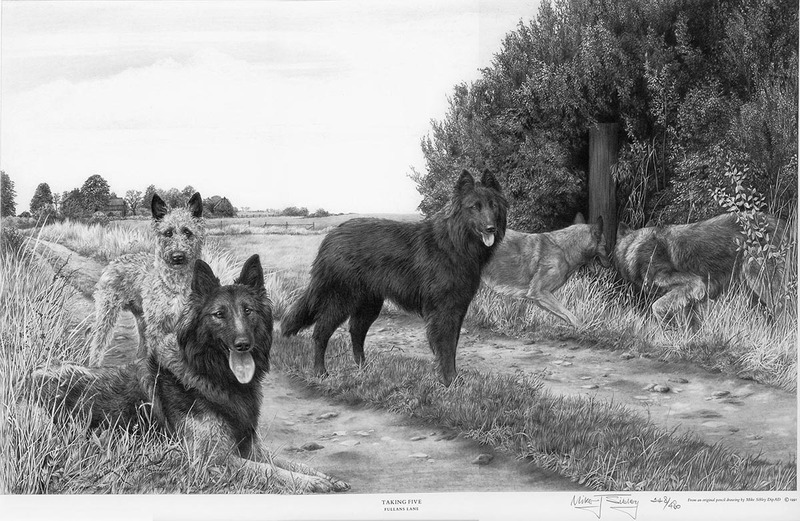 Shown here are the Groenendael (centre), Tervueren (front left and front right), the curly coated Laekenois (rear left) and smooth coated Malinois (rear right). The setting suggested itself as I photographed Mazda, the Tervueren. The photography took place in our top field and I stepped down into the ditch alongside the lane to get a low angle shot. What I saw through the viewfinder suited my purposes exactly! The view is the track leading to our house. The post in the Blackthorn is our gate-post and the farm in the background is that of our neighbour. The only substantial change was the omission of most of the pot-holes! The original drawing took 145 hours to complete and remains in my private collection.